This new kit is a totally new way to light up a vehicle. The LED strips look like a typical LED strip, but actually have 3 part LEDs embedded on the strip, to use primry color funtions (Red, Green, & Blue) along with white, to allow for custom colors and more. The remote will allow you to change color intensity, run programs like fade from color to color, strobe the lights, and more. Really inovative way to accessorize your ride. 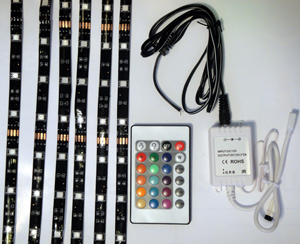 Kit comes with 6 LED strips (2-40", 2-20", and 2-8") a Infra red remote control, connector cables, 3M adhesive tape, strink wrap, and color step by step instructions.